Taking part in an activity can have significant benefits for those suffering a mental health issue. Local mental health association, Derbyshire Mind, have found their walking group to be particularly successful. 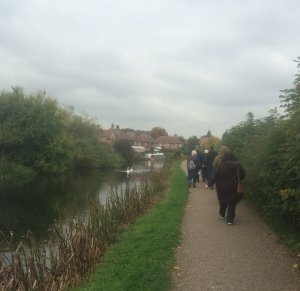 'Enjoying Derby' is an established walking group that offer a varied walking programme on Tuesdays and Thursdays. The walks are between one and three miles and start from Derby city centre, however the group travel out to other areas including Shipley, Elvaston Castle, Melbourne, Chesterfield and Bakewell. The group, organised by Derbyshire Mind, has been going since 2009 and is open to anyone, including those of us with mental health issues. The group's walk leader, Kat Frakes, is one of the key reasons to the group's success according to Caron Kirkham, Derbyshire Mind's Training and Community Development Manager. "Kat's great, she's very experienced in working with people with mental health issues and those with learning disabilities as well," she says. "She understands the importance of going at everyone's own pace and helps to create the friendly atmosphere that the group has." Walkers are encouraged to take on responsibilities in order to help the group run and help with their own self-esteem and confidence. There are eight trained assistant leaders who support Cat. Caron highlights the importance of the participants' involvement being driven by their own needs and motivations. She says: "We have participants who help to take the register at sessions and we also have a couple who help to design the walks. "It's up to our walkers to decide what they would like to get involved with, whether it's supporting Cat as an assistant walk leader, or taking the register. It's important that the individual chooses what is right for them." At the heart of the group is a culture of taking everyone's needs into account and creating an environment that is friendly. Caron explains: "The social side of the group is very important to the participants'; it's something that is created by the nature of the activity itself. "Walking provides a great opportunity to talk with someone side by side, this makes it much easier for building their confidence. "Compare this to sitting opposite someone, for example, which can be daunting and not feel as comfortable for some people." The small things make the difference at 'Enjoying Derby', where cafés are always planned into the routes for each walk so that the participants can all have a drink together at the end. Caron is passionate about more people getting involved in the walks. "I encourage anyone to come and try out the sessions, see what you think and give it a go," she says. "We have found that anyone who has come along has enjoyed it and come back for more walks with us." If you would like to walk with with the group, take a look at the walking programme and go along – you can just turn up on the day. The first walk is free, after that it's £3 which helps the keep the group going. To find out more about Derbyshire Mind's 'Enjoying Derby' walking project, visit their website. You can also discover more about walking in Derbyshire, including tried and tested routes, visit the website here.